From UNEP DTU Paper, read the introduction here. With support from various government and donor-funded programs and NGO projects, as well as private over-the-counter sales of products and appliances, the market for small-scale solar appliances has existed for many years in SSA. Recently, however, the sale of pico-scale PV appliances to private consumers has seen tremendous and unprecedented growth, which has been left largely unnoticed by the general public. 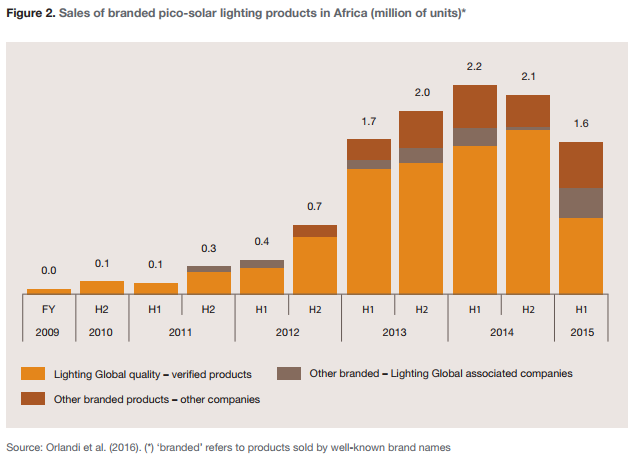 As shown in Figure 2, below, the total annual sale of pico-solar products in Africa has been estimated by Orlandi et al. (2016) to have increased from less than 100,000 per year in 2010 to more than 4 million units sold in 2014. Available forecasts suggest that this growth rate is expected to continue in the coming years. With a current market penetration of only 3% in a continent with roughly 600 million people living without access to electricity, of which the IEA estimates 20% will most optimally be served by offgrid solar solutions, the potential for further market growth certainly exists. Under favourable conditions, it is forecasted that sales of quality-certified SHS could grow to as much as 17 million units per year by 2030 (Scott and Miller, 2016). An even larger market may exist due to the sale of so-called generic products, such as no-name products, copycats and counterfeits, which according to Orlandi et al. (2016) account for at least half of all pico-solar sales. 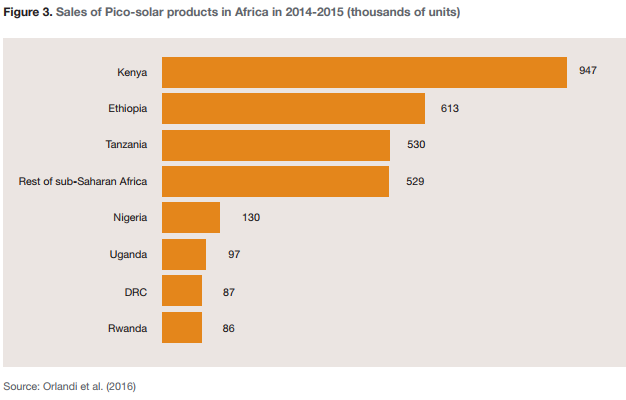 Interestingly, the sale of pico-solar products are mainly in East Africa, in particular Kenya, Ethiopia and Tanzania, who account for two-thirds of total sales, as seen in Figure 3. The markets in Rwanda and Uganda are still comparatively small, but are expected to be the next to grow rapidly since many private companies have been entering over the past two years (Scott and Miller, 2016). A few years ago, pico-solar products were mainly Solar Portable Lights, but due to the emergence of energy efficient lighting alternatives, especially the Light Emitting Diodes (LED) lamps and energy efficient LED-based television sets, there are currently a number of small SHS on the market in the range of pico-systems (5-10 Wp), which are providing the same services as the much larger solar home systems did only 10 years ago (Hansen et al., 2015; Orlandi et al., 2016). This means that while these Pico products are generally smaller compared to SHS, offering mainly the service of lighting and battery charging, pico-systems are increasingly sold as larger integrated kits, combining lighting, mobile charging and electricity services for small appliances — e.g. radios. Surveys conducted in a number of SSA countries reveal how a vast majority of the customers buying pico-solar products show interest in either purchasing a second light or upgrading their system to have increased capacity and functionality (Scott and Miller, 2016). The market for SHS is also experiencing a movement towards larger systems that can accommodate multiple devices such as televisions, fans and small refrigerators. As an example of the fast development, one of the leading suppliers of Pico and SHS products from Kenya, called M-KOPA, started in 2012 and has since managed to install more than 300,000 units in Kenya, Tanzania and Uganda. In comparison, prior to 2012 around 320,000 SHS had been installed in total in Kenya over the past 30 years (Hansen et al., 2015).